Koko was the setting last night for one of those unusual concerts, a rare and special event. Mono performing with the Holy Ground Orchestra, only the fourth time this concert has been played these last few years, previously in New York, Tokyo and Kuala Lumpur . Given this is only performed every few years it is likely that this London show may well be the last time this is seen in Europe for a fair while. It seemed no surprise that the music played in the lead up to the heart of the concert was the astonishing Symphony No 3: Symphony of Sorrowful Songs by the Polish composer Gorecki, one of the most emotionally affecting symphonies; heartbreakingly beautiful music. The addition of a 24 piece orchestra of strings, flutes and percussion to the Mono configuration could only add to the symphonic quality of their music, adding a further richness and nuance to the live performance. Baffled by perspex screens as shelter against the amps, it is true that initially the value of the orchestra was not clear. Where it really came into its own was with some of the quieter songs, often the shorter ones that can often be left out of a more normal Mono gig. On these more delicate moments the strings were used to fill out and broaden the sound without overshadowing the lead melodies. So the orchestra worked, increasingly, well in many area but was predictably least effective for the more monumental sections. Overall however the added orchestra conferred a greater sense of drama, helping to build the concert into a special, noteworthy occasion. With the set comprising much of Hymn to the Immortal Wind, I was struck again by just strong a set Hymn is, how much better it hangs together as a suite of music. This is truly magisterial music, with its greater use of light and shade reinforcing Mono’s ‘symphonic’ tag. But woven into the Hymn material it was a pleasure to hear items like 2 Candles, 1 Wish and Where Am I. It is worth taking a moment to reflect on the quality of the musicianship from Mono – its alittle easy sometimes to somehow imagine that the wondrous sounds are thanks to the buttons and pedals and other buts and pieces. Tamaki’s bass playing showed the quality of her technique by putting out the most muscular sounds with the lightest of touches, almost stroking the strings, her elfin figure at odds with the music she produces. You can have noting but admiration and respect for Takada’s combination of the periodic ferocity of his playing and the accuracy and delicacy deployed when required. Both Yoda and ‘Taka’ produce amazing sounds from their guitars and tonight ‘Taka’ created great washes of sound – one track he seemed to run out of things to do after throwing his guitar away, twiddling his knobs and pedals, he ended up beating the floor with his fists. Its difficult to know just how much rehearsal time the band and orchestra had had together, at some points it appeared difficult for conductor to follow proceedings, so the percussionist showed the beat from the back, where he had a better view of the band. The end of the concert was slightly surreal, a bizarre music track and confusion over whether there might or might not be an encore (there wasn’t). But despite any difficulties, the ninety minutes flew past, a set of glorious music in amn exceptional situational. Tracks like Halcyon were outstanding but it was the likes of Pure as Snow and Everlasting Light that were the most transcendent, uplifting and euphoric. A remarkable band, remarkable music and an evening to remember. Young @binmouth, the Fair Nicola and I left Mornington Crescent having witnessed a special occasion and wended our way back to Paddington and the last train to Bristol . 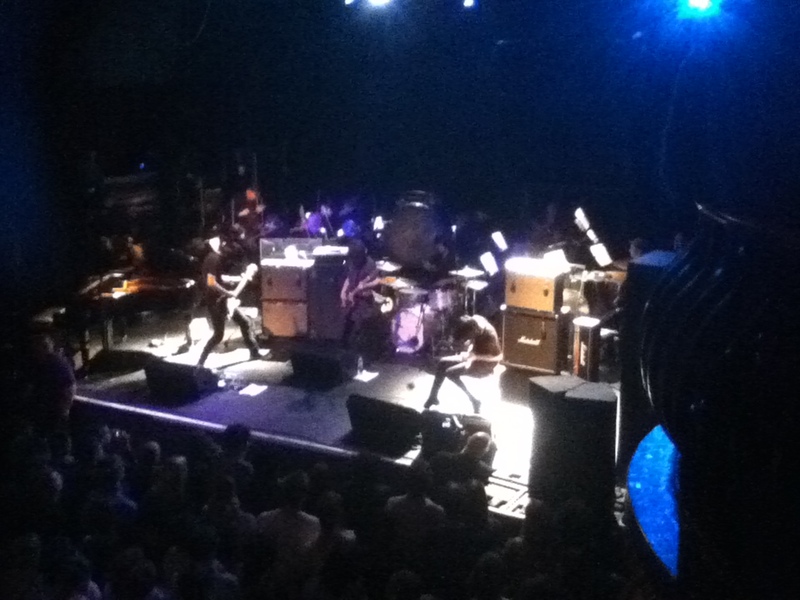 This entry was posted in Uncategorized and tagged Gig, Holy Ground Orchestra, Koko, Mono. Bookmark the permalink.